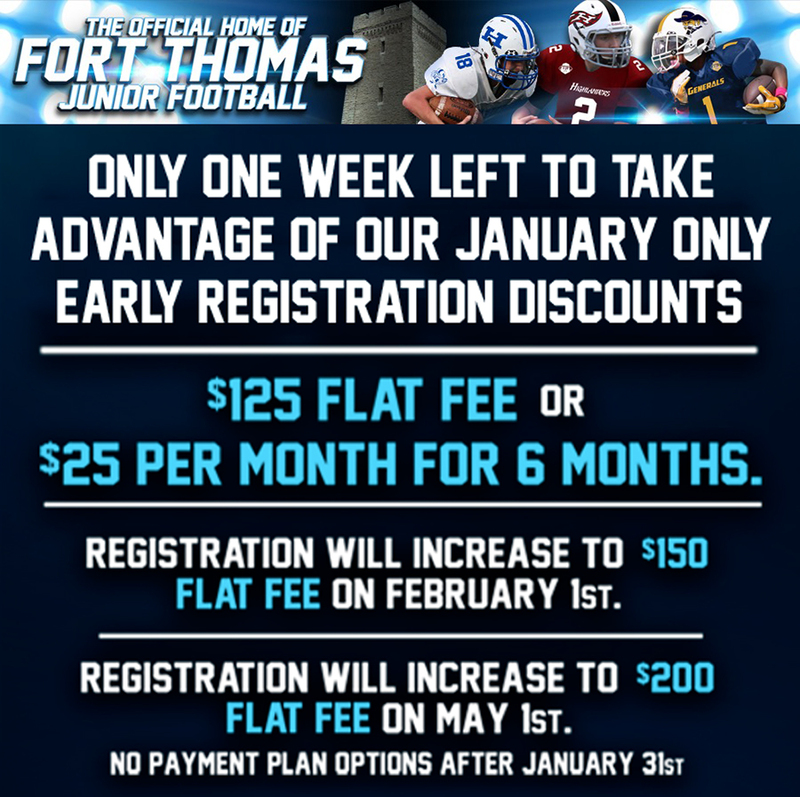 The Fort Thomas Junior Football League would like to remind parents that there is only one week left in the JANUARY ONLY Early Registration Period. Starting February 1st, fees will increase to a flat fee of $150 (no payment plan options). 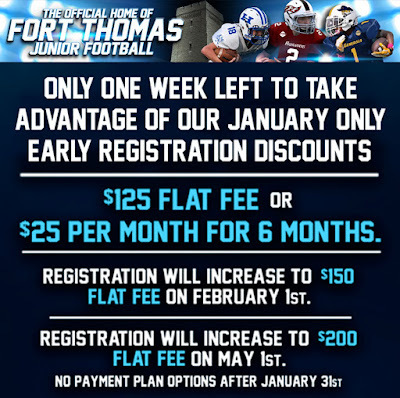 Sign up now at www.fortthomasjrfootball.com!" The Fort Thomas Junior Football League is in the planning stages of hosting its 1st Annual Alumni Spring Football Tournamentin late April or early May of 2018. This will serve as our primary fundraising event. This year we will be expanding Spring Football practice to our 7th and 8th grade players as we continue to build upon the decades of tradition this league afforded many of us. Once we are able to solidify the Spring Football dates for our players, we will be planning an Alumni Flag Football Tournament around the potential Spring Football 7th and 8th Grade Blue/White Scrimmages. Please let us know if you would be interested in fielding a team to represent your Class based off the criteria below. · Games will all be completed over the course of a single Saturday. All games will be played at a single site with the exception of the Championship Games. Championship Games will be played at a different location followed by food, drinks, and entertainment. · Eligible players must have either played in the FTJFL or for Highlands Football. Teams should be comprised of Players within the same Graduating Class. · Teams need a minimum of 8 players with a maximum of 15 players. A single class can register multiple teams. The cost per team will be $350. Please contact Brian Ulbricht at (859) 630-8168 or bulbricht@nsrecycle.com if you are interested in fielding a team. We would like to get an idea of the number of teams interested in participating. Help support of the tradition of the FTJFL.